Last night at World Tea Expo 2014, we had fun on the Tea Bloggers Roundtable. Nicole Schwartz (AmazonV) live tweeted questions and answers for those who couldn’t attend, and Geoffrey Norman (Lazy Literatus), who was on the panel last year, heckled us from the audience. Our friend TeaPigeon from the exhibit floor (pictured below) was unable to attend the roundtable. Something about too much oolong. 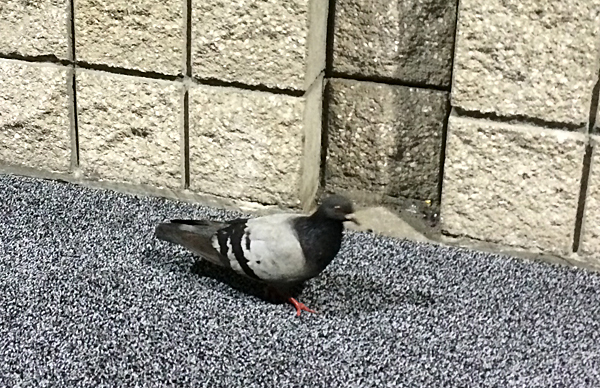 That isn’t pavement, it’s the comfy carpet of the exhibit hall floor beneath the tired feet of TeaPigeon. We declared him our official show mascot. For more pictures of him and a buddy, check #TeaPigeon (and #TeaPidgeon) on Twitter. Q: What do you do if someone sends you a sub-par tea to review? A: Most of us review only what we like, so if we get a bad product we don’t talk about it. If we do, we tend to lay it on the line. Q: What’s the best time of day to update the blog and social media? A: For the most part, we don’t post to the blogs on a schedule (except for Nicole, who posts at noon Eastern time), but we try to do the social media links early in the morning, as most folks check their Facebook and Twitter feeds first thing when they get up. Some of us repeat links in the afternoon, typically with different text. Q: Do you blog about tea and health? A: That’s a topic that’s in much demand, but there’s so little proper scientific research that we’re all hesitant to do it. Studies tend to be myopic (good word, Chris! ), and media coverage of the studies often distorts the results. The dearth of data means everyone’s looking for solid information, but the research is time-consuming and can be expensive; not all of the studies are available for free on the Internet. Q: How do you deal with word count? A: Some tea bloggers (Geoffrey, for example) worry about whether their posts are too long and rambling. Others (like me) want to make sure there’s enough content to make them worth reading. The beauty of the Internet, though, as compared to print media, is that we don’t have hard limits. Doug Robson pointed out from the audience that for the first time in history, we have a medium with infinite scrolling. You can fit ten thousand words as easily as you can fit ten words. There’s no reason to trim it back. Well, I need to get going and hit the last day of Expo, so I’ll cut this post short and talk more about tea blogging later. In case you’re interested, I started my day with a lovely golden tip Yunnan tea from TeaSource. That’s my kind of black tea! Posted on 31 May 2014, in Tea Biz and tagged Association of Tea Bloggers, blogging, Chris Giddings, Doug Robson, Geoffrey Norman, International Tea Moment, jen piccotti, Lazy Literatus, Linda Gaylard, Naomi Rosen, Nicole Martin, Nicole Schwartz, TeaSource, Walker Tea Review. Bookmark the permalink. 4 Comments. It seems you all kept up a brave face whilst devastated at my absence. When we went out for dinner afterward, we thought of hoisting a glass in your general direction, but never got around to it. It was an excellent panel…which is why I kept my heckling to a dull roar.